A retired executive, Bill was with Citibank/Citigroup for the last thirty years of his professional career. Most recently, he was Chairman and CEO of Diners Club International, Citi’s $35-billion global charge-card business. He was also responsible for the global Citicorp Travelers Check business, ultimately sold to American Express. Bill previously ran a division of Citi’s global Private Bank, subsequently becoming the Group’s CFO. He also spent 5 ½ years in London, first as CEO of Citibank Savings, then as Region Head for Diners Club Europe, Middle East and Africa. This followed 5 ½ years in Rio de Janeiro, Brazil, responsible for Citi’s various consumer businesses, including upscale retail branches of a finance company, and Credicard, Brazil’s largest credit card business. Prior to moving abroad, Bill assisted in the formation and launching of Citi’s global Consumer Financial Services Group, as its CFO. Before joining Citi, Bill was Executive Vice President and Chief Operating Officer of Keystone Aeronautics (an FAA Part 135 commercial aviation company) for three years – a great experience in small business turnarounds. With a B.S. in Mathematics from Lafayette College and an M.S. in Industrial Administration from Carnegie Mellon’s Graduate School of Business, Bill started his career at Ford Motor Company as a financial analyst. Interspersed with his professional career were two periods of active duty with the U.S. Air Force and Michigan Air National Guard, where he served 7 years as a single-seat fighter pilot. Bill’s community-service activities include having been President of the Board of Trustees at the Rye (NY) Presbyterian Church, where he was also an Elder; Chairman of the National Association of Endowed Presbyterian Churches; Director and Treasurer of the Rye Arts Center; Financial VP of the Rye Babe Ruth League; Director and Treasurer of the Indian River Tea Party (Vero Beach, FL); Chairman of the Environmental Learning Center (Vero Beach); and member of the Steamboat Institute’s National Advisory Board. He was also President of the Bent Pine Golf Club in Vero Beach. 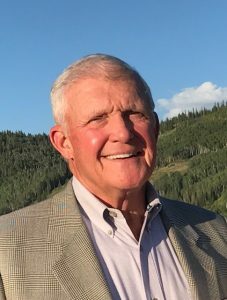 Bill enjoys golf, fishing, hunting, bridge, photography, and skiing. Bill married his lovely wife Susan in 1971. They now reside in Vero Beach, Florida, and Steamboat Springs, Colorado. With the help of their two outstanding children, Liz and Quint, they now have three wonderful granddaughters and (latest addition!) one happy grandson.